The Last Night of the 2016 Proms. 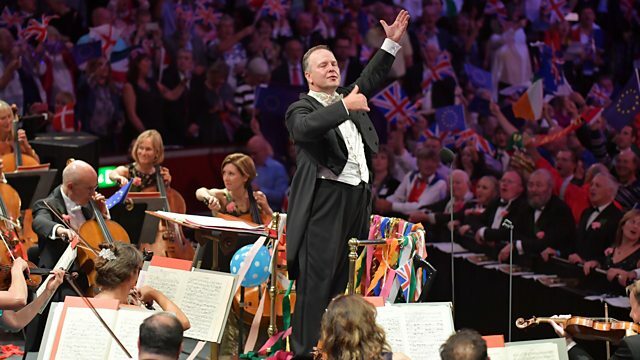 Leading soloists join the BBC Symphony Orchestra and Chorus and BBC Singers conducted by Sakari Oramo. Orchestra: BBC Proms Youth Ensemble. Orchestra: BBC Symphony Orchestra. Conductor: Sakari Oramo. Choir: BBC Singers. Choir: BBC Symphony Chorus. Orchestra: BBC Symphony Orchestra. Conductor: Sakari Oramo. Singer: Juan Diego Flórez. Choir: BBC Singers. Choir: BBC Symphony Chorus. Orchestra: BBC Symphony Orchestra. Conductor: Sakari Oramo. Performer: Juan Diego Flórez. Orchestra: BBC Symphony Orchestra. Conductor: Sakari Oramo. Singer: Duncan Rock. Choir: BBC Singers. Choir: BBC Symphony Chorus. Orchestra: BBC Symphony Orchestra. Conductor: Sakari Oramo. Orchestra: BBC Symphony Orchestra. Conductor: Sakari Oramo. Performer: Francesca Chiejina. Performer: Eve Daniell. Performer: Lauren Fagan. Performer: Alison Rose. Performer: Claire Barnett-Jones. Performer: Marta Fontanals-Simmons. Performer: Anna Harvey. Performer: Katie Stevenson. Performer: Trystan Llŷr Griffiths. Performer: Oliver Johnston. Performer: Joshua Owen Mills. Performer: James Way. Performer: Bragi Jónsson. Performer: Benjamin Lewis. Performer: James Newby. Performer: Bradley Travis. Singer: Juan Diego Flórez. Singer: Andrew Rupp. Choir: BBC Singers. Choir: BBC Symphony Chorus. Orchestra: BBC Symphony Orchestra. Conductor: Sakari Oramo. Orchestrator: Edward Elgar. Choir: BBC Singers. Choir: BBC Symphony Chorus. Orchestra: BBC Symphony Orchestra. Conductor: Sakari Oramo.